Just wanted to put everybody on notice that the good reviews keep coming in. Today was a good day in the life of The Cooking Gene. I got word from Ted Lee that the Kirkus Review had issued its response to the book. It was pretty awesome—and a starred review!! If you’re an avid follower or follow me on social media, please share the good news on your site or social media platforms. You birthed this project, you sustained it, and now it’s time for the final push—selling the book and everything it represents for our future, our country and our world. Sharing is free and in a world where going electronically viral is key to survival, absolutely necessary. I appreciate my supporters and their willingness to get the word out. 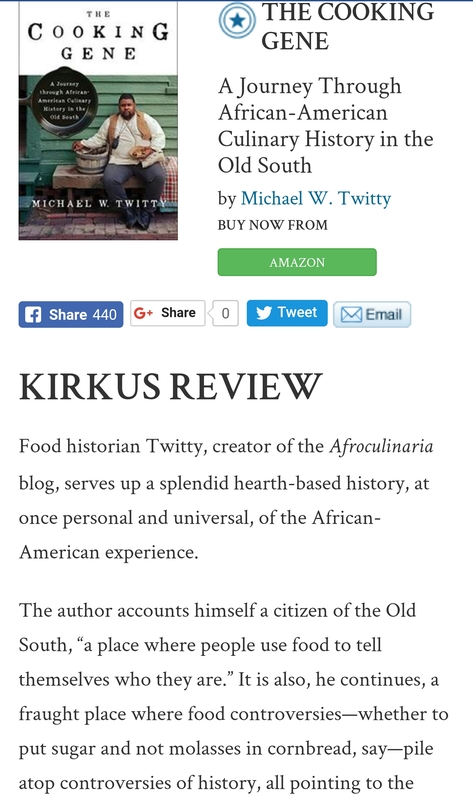 If you’re jazzed by the review and are ready to order your own copy click here! Much love y’all. We are almost there! Mazal tov! Well deserved, I have no doubt! Can’t wait for my copy to arrive!